I made a stuffed cactus and I love it! It was one of the projects from Felt for the Home, which I received from Leisure Arts to review. 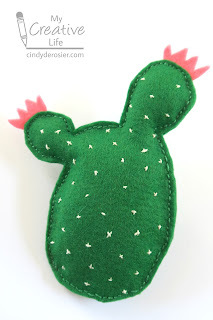 I chose to make the prickly pear. 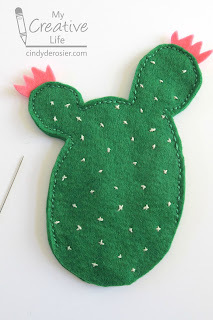 The first step was cutting out two cactus-shaped pieces of green felt and some flower-shaped pieces of pink felt. I used white embroidery floss (3 strands) to cross stitch little x's randomly on one of the cactus pieces. 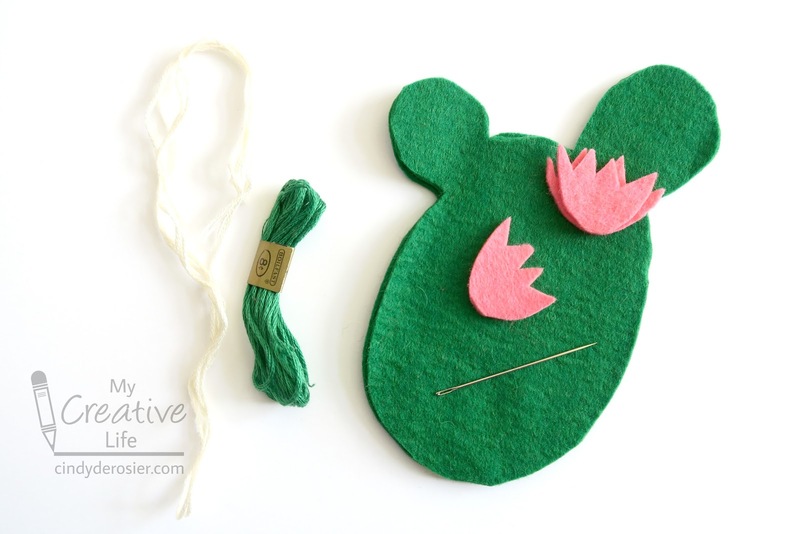 Then I used green embroidery floss (also three strands) to backstitch the two cactus pieces together, sewing the flowers in place as I went. I left the bottom unstitched. 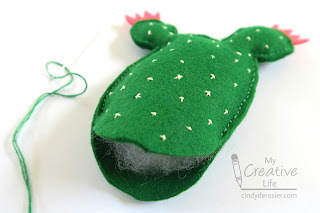 I added stuffing, using a chopstick to push it up into the arms of the cactus. Finally, I sewed the bottom together. All done! I love that the cacti from the book are displayed in clay pots with pebbles. I'm strongly considering the same, although my 'pebbles' would actually be these. Wouldn't that be a fun gift?! 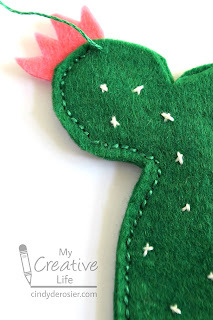 Felt for the Home would be another great gift. 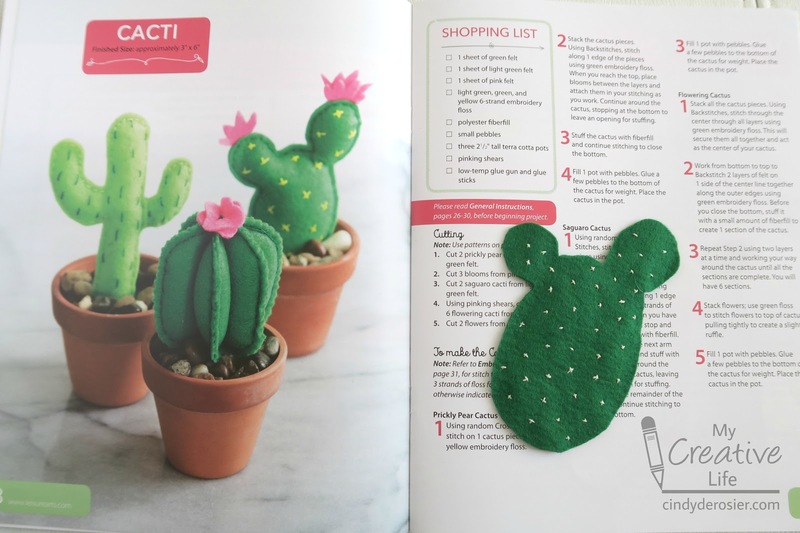 There are ten project ideas, with detailed supply lists and steps, as well as patterns and a guide to embroidery stitches. 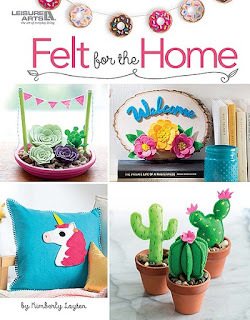 I love the donut garland, the succulent garden, and the heart pillow in particular. 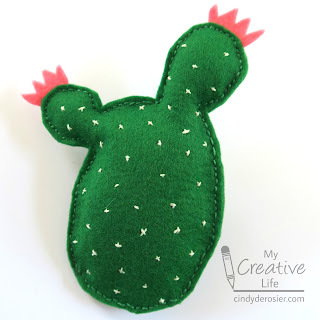 Best of all, they're easy enough for a sewing novice like me. I see a lot of felt crafting in my future! Such a fun project, Cindy! I love the adorable cactus you made! And I hope you do purchase some of the "pebbles" (Yum) you have posted and make someone a very fun gift!!!! !